What happens when Subaru invites us to Spain to test drive the 2017 Subaru BRZ? We get lost in a maze of dangerously narrow alleys, beat the crap out of the car on track, and drive so far off the suggested return route that the scenery changes from dead grass and open fields to a snowy ski resort at the top of a mountain. Yet this series of events led to a vehicle evaluation that delved deeper than any test drive at a dealership. We learned the ins and outs of the 2017 iteration of the Subaru BRZ, with an in-depth look at the braking and handling capabilities of the newly released Performance Package. The first item to address is that no, the 2017 Subaru BRZ does not come with a turbocharger. Despite the thousands of angry Internet comments, forced induction simply isn’t on the to-do list for now. All you get in terms of power with the 2017 manual transmission models is a modest bump of five more horsepower and five more pound-feet of torque, accompanied by the same dip in the torque curve at 3,500 RPM that’s been taunting us since day one. The final numbers equate to 205 horsepower and 156 lb-ft of torque at the crank. However, Subaru did spice up the 2017 model with a few updates to make it more attractive to the buyer. First, the decision to forego forced induction does not mean that the BRZ’s powertrain was an afterthought for 2017. A redesigned air cleaner box and intake feeds air into the newly designed aluminum intake manifold, replacing the old plastic version. A low friction finish on the camshaft journals, paired with buffed and polished valve stems and revised rocker arm pivots help deliver power with efficiency. 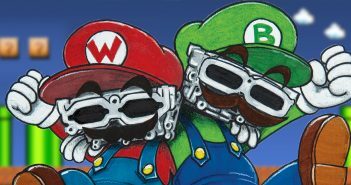 The engine block and pistons are also said to be strengthened. On the outlet side, a larger diameter exhaust manifold and updated collector open up the exit path for spent gases. Although this enables only modest power increases from the factory, these changes in strength and efficiency may prove beneficial for aftermarket modifications. 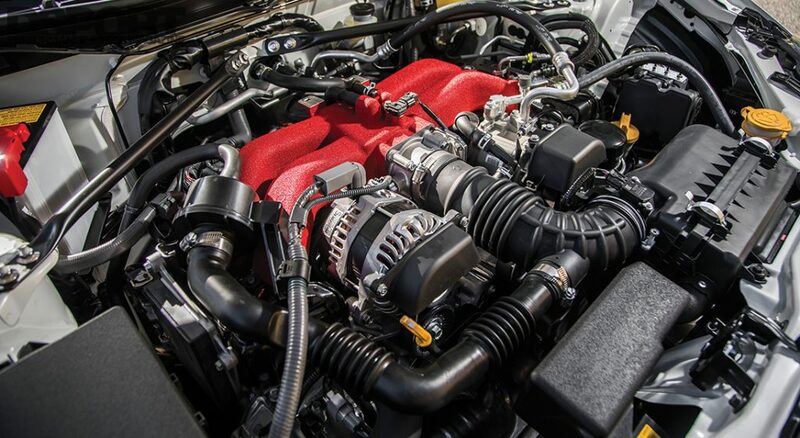 Power from the engine is delivered through the same Aisin AZ6 transmission as before, however, some of the internals are shot peened for durability. As an added benefit for manual transmission models, the final drive ratio changes from 4.1:1 to 4.3:1, improving acceleration especially at low and medium speeds around 30 to 50 MPH. 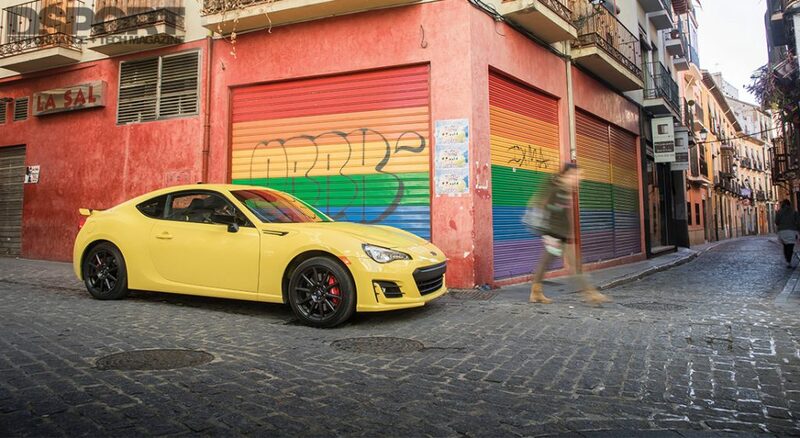 Subaru recognized that BRZ buyers choose this model over the likes of the WRX and other higher power platforms, favoring the roadster’s handling ability. 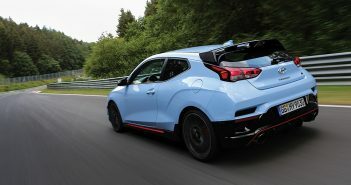 In an effort to improve handling further, Subaru enhanced chassis rigidity with thicker brackets behind the strut tower braces, a larger transmission cross-member plate and additional reinforcements at the rear wheel housings. The suspension took to a few mild updates, including stiffened front springs, softened rear springs and a slightly larger rear stabilizer (1mm increase in diameter). These updates, paired with revised damper tuning, aim to enhance responsiveness and stability further. Since many BRZ owners choose to track their cars, Subaru changed up the available stability control modes to better suit the environment. The “Normal” mode is now less restrictive than before and the 2016 model’s “Sport” mode has been replaced by “Track” mode, offering much less interference for those that like to tease the car’s limits. Even better, users can now completely disable all stability controls. The 2017 BRZ received some alterations to the exterior as well. The redesigned front fascia houses LED headlights and fog lights, with the addition of small winglets and new front fender garnish to increase the car’s low, wide aesthetic. On the back end, you’ll find a new aluminum rear spoiler, designed for more than just looks as it improves the BRZ’s downforce and stability. Top off the exterior changes with a new wheel design, and you have a culmination of subtle aesthetic updates that add up to a notably more attractive model than previous years. Sweetening the deal even further, Subaru offers the 2017 model starting at $25,495, exactly the same as when it launched in 2013. Two types of cars fill out the paddock of any track day event: roadsters and everything else. Track days and spirited driving are essentially what vehicles like the Miata, S2000 and BRZ were made for. Cargo space is limited, advanced driver assistance systems are nearly nonexistent, and the car can spin out from under you if you’re not paying attention. What this class vehicle does deliver, however, is a driving experience that no car with big back seats and a 3,500-pound and heaver footprint can match. Subaru took this concept to heart with the BRZ and figured they ought to put together a package that’s track ready as soon as it leaves the factory. 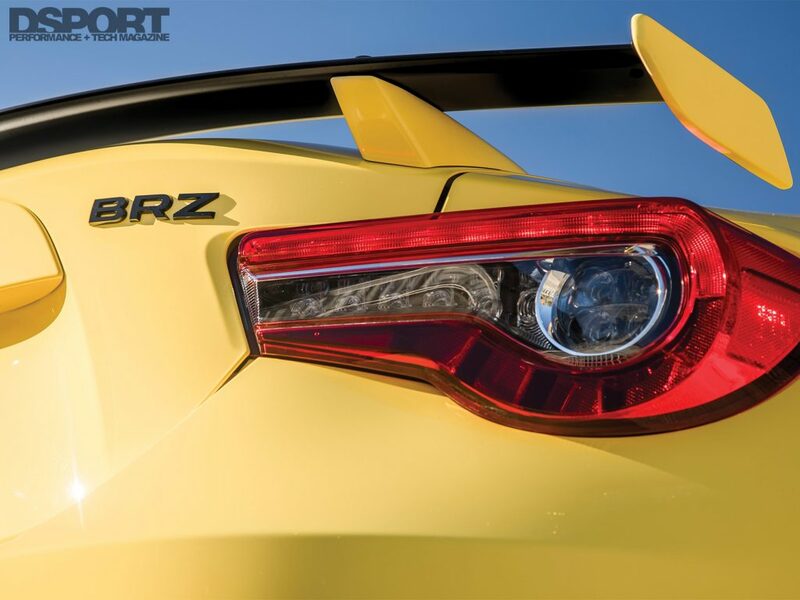 This idea shaped into the Performance Package, a special option for the BRZ that takes its positive tracking characteristics and makes them even better. Beyond the 2017 model updates, the Performance Package includes upgraded brakes, wheels and tires, and suspension. Brembo brakes fill out the wheels with four-piston calipers in the front and two-piston calipers in the rear. Complementing the larger calipers, 12.8-inch rotors sit at the front end and 12.4-inch rotors ride in the back. In order to clear the larger brake system, a set of 17 x 7.5-inch alloy wheels sit at all four corners wrapped in Michelin Primacy HP tires, adding an extra half-inch of width to the base model measurement. With more powerful brakes and an increased tire contact patch on tap, Sachs ZF dampers control the ride for added comfort and better track performance. 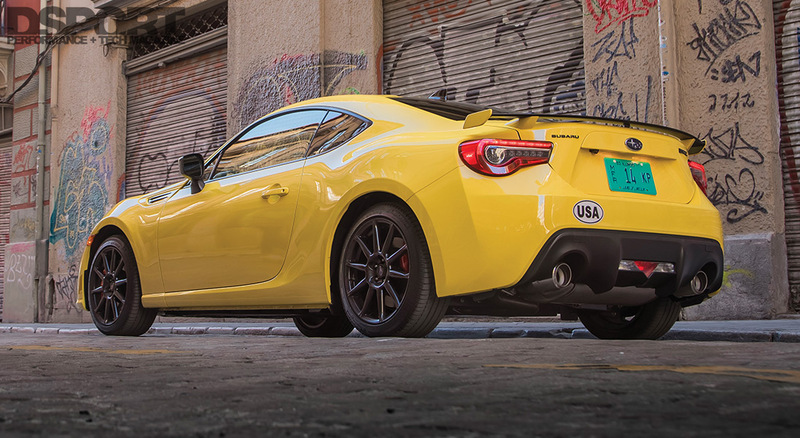 A Performance Package BRZ sports a price tag of $28,840, a jump of $3,345 over the Premium model MSRP. If you’re all about being unique, you can spring for the Series.Yellow model, which includes the Performance Package items as well as exclusive Yellow paint and interior trim. With a limit of only 500 units in production, the Series.Yellow retails at $29,695. As the Performance Package and Series.Yellow models inch closer to $30,000, territory, one might question if the price jump is worth it. Subaru invited me on a trip to Granada, Spain to find out. 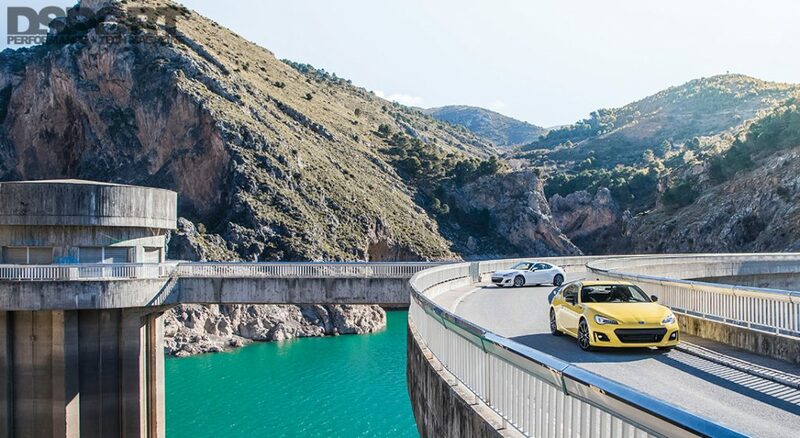 Subaru shipped a small fleet of Performance Package BRZs to Spain, including a Series.Yellow model, for a media day of cruising the streets and highways wrapped around an unrestricted track drive. To kick things off, I took the driver’s seat as another journalist rode passenger and was in charge of navigating us to our destination: Circuito Mike G Guadix. We set out from the hotel and immediately took a wrong turn before we even hit the half mile mark. Already lost in a puzzle of one-way streets, we figured we’d take our time and enjoy the sights. Granada is a beautiful and vibrant city, but driving the city streets is a nightmare. Scattered throughout the many tall and ancient complexes are countless mazes of narrow cobblestone streets. Thankfully, the BRZ in its compact form squeezed past the many obstacles and tight turns that Granada threw. The rocky streets would normally prove teeth-chattering in most cars, and we expected the same for the track-oriented Sachs performance dampers. Yet the BRZ managed to turn the many humps and edges into minor bumps, rarely causing any real discomfort. Aside from the 2017 model’s tweaks to the suspension, driving the BRZ felt plenty familiar to its previous iterations. Steering was tight, the clutch pedal had a short travel distance and the shifter, although still somewhat clunky, had a short throw with solid engagements. Power application in city and freeway driving environments actually felt slightly improved, though this could be a placebo effect with the enjoyably louder and deeper exhaust when the throttle pedal hits the floor. We continued our way through the unfamiliar streets as they opened up to the twisty mountain roads that finally led to the race track. It turns out that the Circuito Mike G Guadix is very similar to California’s Buttonwillow Raceway Park in a few ways. The facilities reside far from any sign of civilization, they offer little more than a small café and a few garages in the paddock, and the winter months deliver brutally cold weather. However, they also serve as excellent test tracks with a mix of tight hairpins, quick esses, long sweeping turns and lengthy straightaways. This is the sort of environment where one can really learn any car’s strengths and weaknesses. To our benefit, Subaru offered open lapping in the BRZs without any limits on speed or traction control settings. After a couple laps to get familiar with the track, I opened it up in search of the car’s capabilities. The 2017 BRZ’s exhaust growls with much more character than before, finally making itself distinctly audible over the wind noise heard at tracking speeds. Although exhaust systems tend to be many owners’ first upgrade to their BRZ, Subaru is offering a much better starting point than before. The car tackled the straightaways with little surprise, delivering enough power to have fun but still not quite scratching that itch for getting kicked into the back of the seat at full throttle. This was only exaggerated with every gear change, as the revs dropped from redline past 7,000 RPM down to the 4,000 RPM range, right in the middle of the infamous torque dip. The last BRZ/FR-S I drove on a racetrack was equipped with Edelbrock’s E-Force Supercharger, which now made me realize that I’ve been spoiled with a taste of what the car could do when modified appropriately. The complaints about lack of power will likely haunt this platform until the day it features a turbocharger, but the manufacturers have explained repeatedly that this car at such a modest price is not designed for the drag strip, it’s designed for the corners. Experiencing the Performance Package BRZ on track only confirms this. The Brembo brakes consistently slowed the car in an instant for each turn. 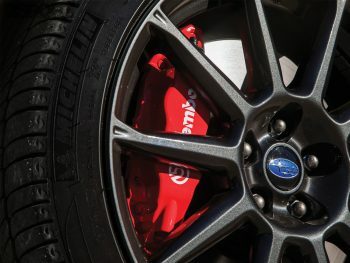 The brake rotor diameters match that of the current WRX, yet the BRZ holds a 550-pound weight advantage, resulting in plenty of stopping power. The brakes gave ample feedback through the pedal, allowing for easily-controlled modulation and effective trail-braking to help the car rotate. I do have a tendency to shred through brakes quicker than many and, although none of the other journalists experienced the same issue, I did find small amounts of brake fade in threshold braking zones around laps four and five. A simple brake fluid and pad upgrade would make this car golden for extended track sessions. 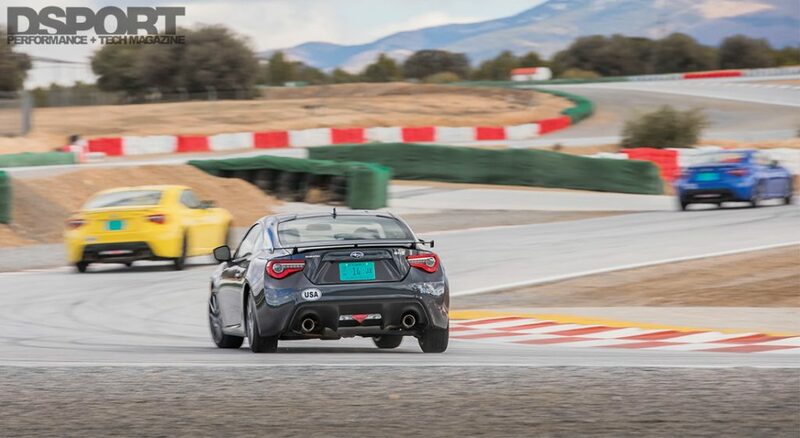 The BRZ loved every corner on the track. The new spring rates with Sachs ZF dampers and thicker rear sway bar did their job to keep the car composed, predictable and balanced. Although I detected small hints of understeer around mid-corner and corner exit, most of this was solved with increased trail-braking to add a little more rotation on corner entry. If I had it my way, I would increase compression on the rear dampers by just a hair. 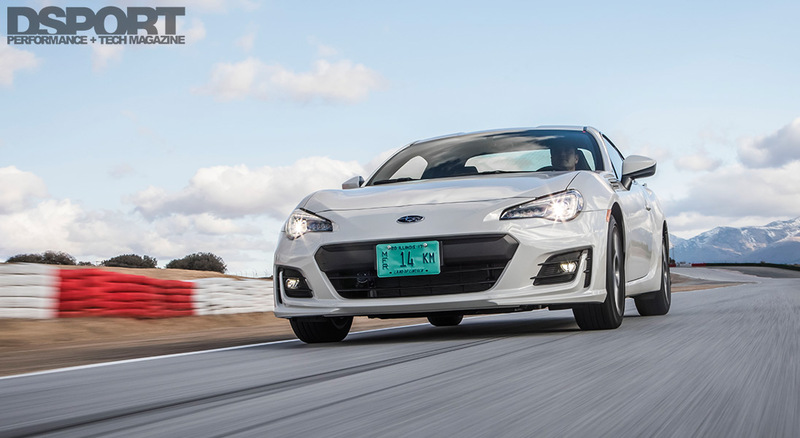 Nevertheless, the BRZ eats up corners and provides plenty of feedback to make anyone feel comfortable and confident in throwing the car around on track. This is only enhanced with the stability control options. “Track” mode gives loads of freedom to the driver, only interfering when the car goes beyond the limits of what one would call a fast route through a corner. For the bravest (and at times the brainless), the stability controls can be switched completely off. Unless you’re competing with the car wheel-to-wheel in race trim or drifting it around corners, “Track” mode will suffice for nearly all of your spirited driving antics. After the fleet of cars turned their laps around the track, each one set out to return to the hotel. This time I was paired with Dale Lomas, an endurance racer who regularly pilots an 86 Cup car and lives at the Nürburgring. On a whim, he decided we’d take a detour through the scenic Sierra Nevada, a snowy mountain range that climbs up to about 9,000 feet. Despite the sharp twists, blind corners, trees on the shoulders and the icy road surface, he raced us up the mountain to discover some of the most beautiful scenery of the whole journey. In this RWD car on street tires, the BRZ still handled the snowy mountains with confidence, even if it spent some of this time sideways. From the city streets, to the track, to the dangerous mountain roads, the Subaru BRZ with Performance Package proved itself a fantastic daily driver and weekend track star for the price. Although sufficient in power, there’s room for more with forced induction, and it’s not the lightest modern car out there but still competitive at just under 2,800 pounds. There are four seats inside but the rear seats realistically serve only as extra storage space. 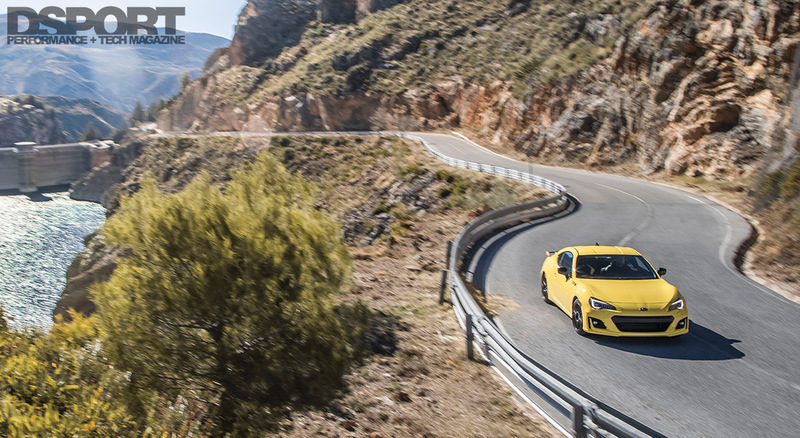 However, the BRZ is all about the driving experience, particularly in its handling ability. 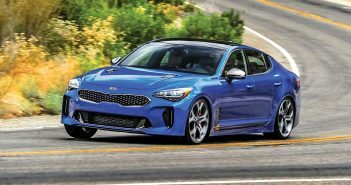 With 2017’s enhancements, especially with the Performance Package, few drivers would ever find themselves bored on the street or on the track when behind the wheel. Better yet, the platform’s aftermarket support grows each year, providing owners the option to turn the car into exactly what they want it to be. This platform is still young at only five years old, but this round of updates shows that it’s already headed in the right direction for the future.